MediaCorp DAB transmissions on Band III Blocks 7B and 7C ceased from 1 Dec 2011. Times are shown in UTC (GMT). Local time in Singapore is UTC + 8 hours. This list includes radio stations in Singapore, and the adjacent areas of Indonesia and Malaysia. The main languages in Singapore are English, Chinese, Malay and Tamil. 24h relay of BBC World Service English for Asia-Pacific stream from London, with local continuity announcements at times. Formerly 'HOT FM91.3', 'Heart 91.3FM', 'WKRZ 91.3FM' and 'Radio 91.3'. Frequency used until Sep 2016 by Expat Radio XFM (Mediacorp). Lush 99.5FM was launched 31 Dec 2004 and closed down in Sep 2017. 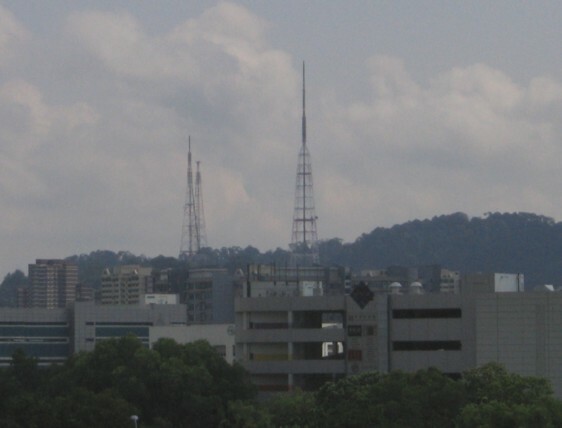 Frequency was used by Passion 99.5FM (National Arts Council of Singapore) until Dec 2003. Formerly Radio Heart 100.3FM and Radio 100.3. Transmitter power: 3.5kW (reportedly operating at 0.5kW), antenna height 65 m asl. Ex-101.5 MHz. Local relay for Johor Bahru city. Radio Republik Indonesia (RRI Batam Pro-2). Be 107 FM, Tiban 3, Batam. BBC World Service in English is relayed in Singapore on FM 88.9 MHz as "BBC Singapore". Operates Class 95FM, Gold 90.5FM, Love 97.2FM, 938LIVE, Oli 96.8FM, 987FM, Ria 89.7FM, Symphony 92.4FM, TVMobile, Y.E.S. 93.3FM and Warna 94.2FM. Operates the Far Eastern Relay station at Kranji on shortwave, relaying programmes of BBC World Service, NHK World etc. Operates Money FM 89.3, One FM 91.3, Kiss92 and UFM 1003.